Octorose ® Royalty Custom Waterfall Window Valance and Swags & Tails 66x47"
Octorose ® Royalty Custom Waterfall Window Valance and Swags & Tails 66x37"
OctoRose Royalty Organza & Satin Double Layer Window Curtain Panel Set 118x84"
A Pair of Beige / Black with embroidery Window Curtains / Drapes / Panels with Sheer Lining and Valance Set 120x84"(WxH). A Pair of Rose / Black with embroidery Window Curtains / Drapes / Panels with Sheer Lining and Valance Set 120x84"(WxH). 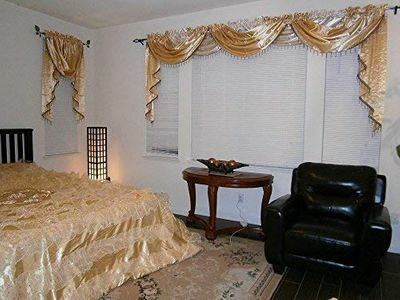 A Pair of Short Fur Chocolate Brown Printing Window Curtains / Drapes / Panels with Sheer Linen and Valance Set. A Pair of Micro Suede Black Printing Window Curtains / Drapes / Panels with Sheer Linen and Valance Set. A Pair of Micro Suede Green Window Curtains / Drapes / Panels with Sheer Linen and Valance Set.